To report the 52-week treatment outcomes with intravitreal injections of aflibercept using a treat-and-extend regimen for treating macular edema secondary to central retinal vein occlusion (CRVO). A retrospective analysis of patients newly diagnosed with CRVO was performed. Patients receiving aflibercept between 1 December 2016 and 31 March 2017 were included in the analysis. Data on age, gender, visual acuity measured on Early Treatment of Diabetic Retinopathy Study charts, presence of macular and peripheral ischemia, anatomical changes observed on spectral domain–optical coherence tomography examination and the number of injections needed were recorded. The mean gain in vision was 17.8 ± 19.1 (± standard deviation) letters and 15.1 ± 20.2 letters at weeks 24 and 52 of follow-up, respectively. The proportion of patients who gained ≥ 15 letters in best-corrected visual acuity was 52.9% at week 24 and 50% at week 52. The mean reduction in central subfield macular thickness was 331.5 and 311.6 at weeks 24 and week 52, respectively. 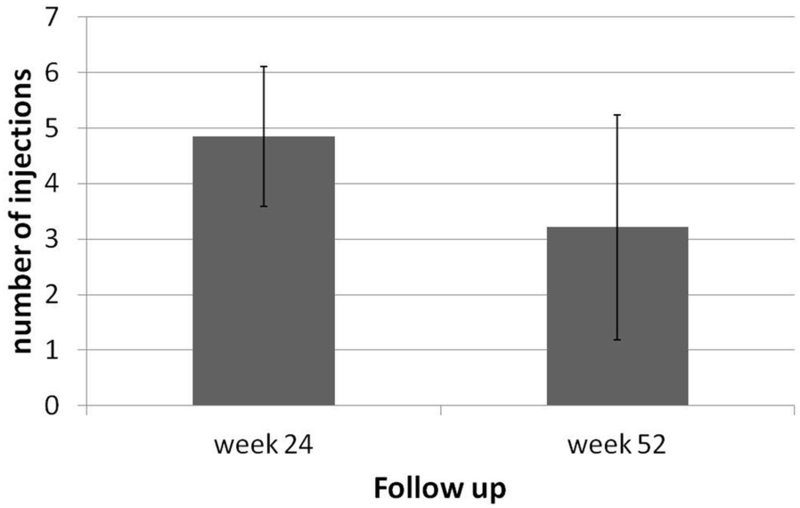 For the patients completing 52 weeks of follow-up, the mean number of treatments was 4.9 ± 1.3 injections in the first 26 weeks and 3.2 ± 2.0 injections in the second 26 weeks. The Moorfields protocol for treating macula edema in CRVO achieves a quick response to treatment without over- or under-treating patients with a fixed protocol. Overall, our individualized treat-and-extend protocol achieved real-life outcomes approaching those of clinical trials. As there are currently no such trials using this practically useful regimen, our study provides real-world evidence for using a treat-and-extend protocol for aflibercept in CRVO. To view enhanced digital features for this article go to https://doi.org/10.6084/m9.figshare.7893683. Retinal vein occlusions (RVOs) are the second most common cause of retinal vascular disease after diabetic retinopathy [1, 2, 3]. Depending on the area affected, RVOs can be broadly categorized as central RVO (CRVO) and branch RVO (BRVO). Although CRVOs represent the smaller proportion of RVO cases overall, they are more likely to lead to severe vision loss and are associated with a high risk of vitreous hemorrhage and neovascular glaucoma . The most common cause of vision loss in patients with central retinal vein occlusion (CRVO) is macular edema, which resolves spontaneously in only 30% of non-ischemic cases and may not resolve at all in ischemic cases [4, 5]. Different treatment modalities have been proposed for the treatment of macular edema following RVOs. The multicenter Central Vein Occlusion Study showed that despite some reduction in macular edema, grid laser photocoagulation provides no visual benefit in patients with macular edema secondary to CRVO . The recent development of intravitreal pharmacotherapy has significantly expanded treatment options and has changed the standard of care for treatment of the disease . Both steroidal pharmacotherapies [7, 8, 9] and antivascular endothelial growth factor (VEGF) [10, 11, 12] intravitreal injections have been shown to be of benefit for eyes with macular edema secondary to CRVO. Due to the side effects associated with steroid use, including increased intraocular pressure and cataract, anti-VEGF agents have emerged as a first-line therapy for most eyes with RVO. Two recent clinical trials, namely the VEGF Trap-Eye: investigation of efficacy and safety in CRVO (GALILEO) [13, 14] and VEGF Trap-Eye for macular edema secondary to CRVO (COPERNICUS) [11, 12, 15], have shown that monthly intravitreal aflibercept treatment was well tolerated and improved visual acuity after 6 months significantly more than sham injections. These improvements were maintained with subsequent monthly monitoring and as-needed (PRN) dosing. It is worth noting that both ischemic and nonischemic CRVO types showed a positive response to anti-VEGF agents based on pivotal trials [10, 13, 15, 16]. Landmark multicenter studies (COPERNICUS, GALILEO) have demonstrated the efficacy of aflibercept use for macular edema secondary to CRVO under highly controlled circumstances. The aim of this study was to report 1-year real-world visual acuity and retinal morphology outcomes of aflibercept treatment for patients with macular edema secondary to CRVO in a clinical setting. This study will allow a meaningful assessment of the robustness of the long-term efficacy response to aflibercept treatment in a real-world clinical setting, using a regime which is more reproducible in real life than an idealized monthly treatment and monitoring protocol. This was a retrospective review of treatment-naïve patients with CRVO treated with aflibercept for macular edema. The study adhered to the tenets set forth in the Declaration of Helsinki of 1964, as revised in 2013, concerning research involving human subjects and was approved by Moorfields Research and Development Department (registration number CA16/MR/35). Electronic case note review was performed using Open Eyes, an electronic medical record application for ophthalmology (Open Eyes Foundation; https://openeyes.org.uk/), supported by a review of spectral domain–optical coherence tomography (SD–OCT) data and paper case notes. A consent form was not necessary due to the retrospective nature of the study. Consecutively treated patients newly diagnosed with macular edema secondary to CRVO between 1 December 2016 and 31 March 2017 were identified from our electronic records and included in the analysis. Inclusion criteria of the study were: (1) treatment-naïve patients with center involving macular edema due to CRVO for ≤ 9 months; (2) a mean central retinal thickness of 300 μm (Spectralis SD–OCT system; Heidelberg Engineering GmbH, Heidelberg, Germany) or 250 μm (Topcon OCT system; Topcon Corp., Tokyo, Japan) on OCT examination; (3) and a best-corrected visual acuity (BCVA) of 24–73 Early Treatment Diabetic Retinopathy Study (ETDRS) letters in the study eye. Only one eye per patient was included. Key exclusion criteria for the study eye included previous laser photocoagulation; any previous intravitreal injection; active neovascularization of the iris, disc or retina; significant diabetic retinopathy in the fellow eye; previous radiation treatment to the neck or head; and intraocular surgery within 90 days of the onset of the CRVO. Additionally, patients with stroke, transient ischemic attack or heart attack within the previous 3 months were excluded. Visual acuity and OCT-based outcomes were reported for 24 and 52 weeks of follow-up. In accordance with our recently updated Moorfields CRVO treatment protocol, we used a loading phase of three monthly injections of 2 mg intravitreal aflibercept. At week 16 efficacy was assessed as follows. If the patient’s vision had improved to maximal and the OCT scan was dry, a fourth monthly injection was delivered. The patient was then treated using a treat-and-extend regime by extending the interval by 2 to 4 weeks up to a maximum of 12 weeks. During the extension phase, if fluid recurred between injections, the interval was brought back to the previous interval at which the OCT was dry. If the patient’s vision improved but had not plateaued due to delayed drying of the macula, treatment was continued at 4-week intervals. Monthly injections were continued until vision was maximal and the OCT was dry. Once the OCT was dry, the treat-and-extend regimen was used as just described. Once 12 weeks had been reached without any recurrence of fluid, the patient could be switched to a PRN regime. The prespecified retreatment criteria in the PRN phase were (1) an increase of ≥ 50 μm in central retinal thickness compared to the lowest previous measurement; (2) presence of new or deterioration of persistent cystic changes within the neurosensory retina or subretinal fluid; (3) loss of > 5 letters from the best prior measurement in conjunction with any increase in central retinal thickness. Treatment cessation was considered in those eyes which showed anatomical response with dry OCT but with no visual improvement. When there was little or no improvement in the OCT scan with three injections, the patient was considered to be a non-responder and was switched to another anti-VEGF or a dexamethasone intravitreal implant was offered. Eyes were also characterized as low-responders if the central retinal thickness did not decrease by > 30% from baseline. All patients were eligible to receive panretinal laser photocoagulation at any time during the study if they progressed to neovascularization of the anterior segment, optic disc, or elsewhere in the fundus. The efficacy and safety endpoints were assessed as described previously [11, 14, 17]. The primary efficacy endpoint was the proportion of patients who gained > 15 letters in BCVA from baseline to weeks 24 and 52, respectively. Secondary endpoints included the mean change from baseline in BCVA and central retinal thickness, the proportion of patients progressing to neovascularization of the anterior segment, optic disc, or elsewhere in the fundus and the number of injections needed from baseline to weeks 24 and 52, respectively. A complete eye examination, including measurement of vital signs, and a review of medical history, concurrent medications and medical procedures was performed for each patient. The VA data were analyzed at 0, 24 and 52 weeks for the eyes included in the analysis. VA measurement in the clinic was carried out using an ETDRS chart at a starting distance of 4 m with the patients’ usual refractive correction where available (supplemented with pin-hole correction). Imaging data obtained using the Topcon model 3D-OCT 2000 SD–OCT system and the Spectralis OCT system were used to determine macular morphology and central subfield macular thickness (CSMT). In the vast majority of cases, the Topcon SD–OCT system was used. The same OCT modality was used for every patient throughout the study. Three graders assessed the macular morphology (ME, GDA, LN). Fundus photography and fluorescein angiography (FA) were performed at baseline to evaluate the anatomy of the retinal vasculature and macular perfusion status. Perfused and nonperfused retinas were defined as those with < 10 disc areas and ≥ 10 disc areas, respectively, of capillary nonperfusion on FA. Macular ischemia was defined as (1) a foveal avascular zone (FAZ) of > 1000 μm and (2) broken perifoveal capillary rings at the borders of the FAZ with distinct areas of capillary nonperfusion within 1 disc diameter of the foveal center in the transit phase of FA. Descriptive statistics were calculated, including the mean and standard deviation (SD), for VA and SD-OCT macular thickness data using Excel (Microsoft Excel for Mac 2011; Microsoft Corp., Redmond, WA, USA). In total, 44 eyes of 44 consecutive patients newly diagnosed with CRVO and macular edema between 1 December 2016 and 31 March 2017 were included in the study. All patients were under the care of Moorfields Eye Hospital throughout the follow-up. In the analysis of the 24- and 52-week treatment outcomes, 34 eyes of 34 patients and 33 eyes of 33 patients were included, respectively. Loss to follow-up was the main reason for the decrease in number of eyes available for analysis. The mean ± SD age of all 33 patients included in the 52-week follow-up analysis of outcomes was 69.4 ± 16.4 (range 37–93) years, and 16 (47%) were female; there were 16 right eyes and 17 left eyes. None of the participants had received any intraocular injection (anti-VEGF or steroids), and none had had prior laser photocoagulation therapy. In one eye of one patient treatment had to be abandoned after the first three monthly injections as there was no response to the treatment. One patient died after completing 6 months of follow-up. The majority of patients (82.3%) had fewer than 10 disc areas of nonperfusion, with 8.8% of patients presenting with macular ischemia. Panretinal photocoagulation laser treatment had to be performed in two eyes of two patients during the first 24 weeks of follow-up. The mean number of aflibercept injections was 8.0 ± 2.6 per eye throughout the 52-week follow-up period (minimum 3 injections; maximum 12 injections, median 8.5 injections), with a mean of 4.9 ± 1.3 injections and 3.2 ± 2 injections given by the end of the first and second 6-month periods, respectively. Visual acuity was available for 34 eyes of 34 patients who completed the 24-week follow-up and for 33 eyes of 33 patients who completed the 52-week follow-up. The pre-treatment, baseline VA ranged from 11 to 76 ETDRS letters (mean ± SD 44.7 ± 20.0 letters); VA at 24 and 52 weeks of follow-up ranged from 11 to 83 ETDRS (mean ± SD 62.5 ± 20.6) letters and from 11 to 89 ETDRS (mean ± SD 59.8 ± 23.1) letters, respectively (Fig. 1). At weeks 24 and 52 of follow-up, the mean gain in vision was 17.8 ± 19.1 (p < 0.001) and 15.1 ± 20.2 letters, respectively. The proportion of patients who gained ≥ 15 letters in BCVA was 52.9% at week 24 and 50% at week 52. The proportion of patients who gained ≥ 10 and ≥ 30 letters, respectively, or those who lost > 10 and > 15 letters, respectively at week 52 of follow-up are shown in Table 1. The percentage of patients with ETDRS of > 69 letters (Snellen Equivalent BCVA > 20/40) was 9% at baseline, 55.9% in month 6 and 55.1% in month 12. The percentage of patients with ETDRS of < 34 letters (Snellen Equivalent BCVA < 20/200) was 38.2, 14.7 and 18.2% at baseline, month 6 and month 12, respectively (Table 2). 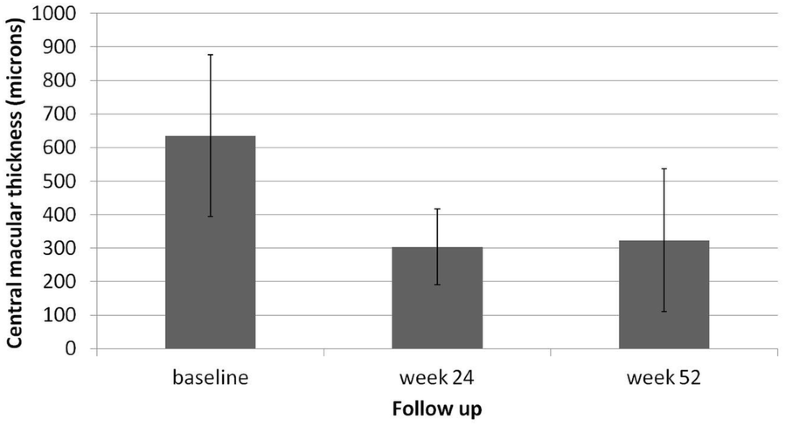 The mean central macular thickness was 635.1 ± 241.1 µm at baseline, 303.6 ± 113 µm in week 24 and 323.5 ± 212 µm after week 52 of the follow-up (Fig. 2). Hence, the mean reduction in CSMT was 331.5 and 311.6 in weeks 24 and week 52, respectively. In addition to assessing the absolute reduction in CSMT, it is important to determine how much macular edema a treatment eliminates. One approach to assess residual edema is to determine the percentage of patients with CSMT ≥ 250 µm. In our patient population, the CSMT was ≥ 250 µm in 35.3% of the eyes at week 24 and in 30% of the at the end of the 52-week follow-up. In eyes with > 10 disc areas of posterior retinal nonperfusion (according to the 7-standard field FA) at baseline, the proportion of eyes gaining > 15 letters at month 12 was 66.7%. For those with macular ischemia, VA dropped by 14.9 ETDRS letters at the end of the follow-up period. The mean number of aflibercept injections was 8.0 ± 2.6 per eye throughout the 52 weeks of the follow-up period (minimum 3 injections, maximum 12 injections, median 8.5 injections). 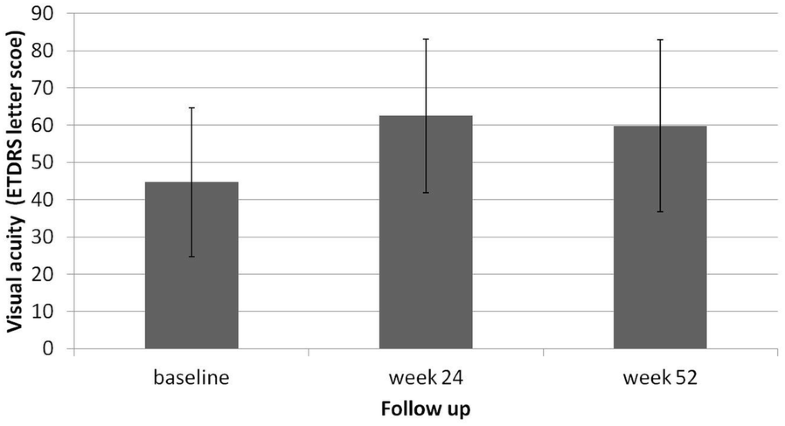 For the patients completing 52 weeks of follow-up, the mean number of treatments was 4.9 ± 1.3 injections in the first 6 months—including the three loading injections—and 3.2 ± 2.0 injections in the second half of the 52-week follow-up period (Fig. 3). The results of this study show that excellent morphological and functional treatment outcomes can be achieved when eyes with CRVO are treated with intravitreal aflibercept injections in a real-life clinical setting. In this cohort of patients treated at Moorfields Eye Hospital, a gain of ≥ 15 ETDRS letters from baseline was achieved in 52.9% of the eyes at week 24 and in 50% of the eyes at week 52. These results are comparable to the outcomes reported in large randomized controlled clinical trials. The 1-year results from the phase 3 COPERNICUS study  showed that 56.1 and 55.3% of the patients gained ≥ 15 letters from baseline at weeks 24 and 52, respectively. One-year results from the GALILEO study  showed that the mean percentage of patients gaining ≥ 15 letters was 60.2% in the aflibercept group at week 52. In our study, the mean gain in vision was 17.8 ± 19.1 letters at week 24 and 15.1 ± 20.2 letters at week 52. These gains are comparable to the 16.2 letters gained in the aflibercept treatment arm of patients at 1 year from the COPERNICUS study  and to the 16.9 letters gained in the aflibercept-treated patients in the GALILEO study . The mean number of aflibercept injections needed in our study was 8.0 ± 2.6 per eye throughout the 52 weeks of the follow-up period. For the patients completing 52 weeks of follow-up, the mean number of injections was 4.9 ± 1.3 and 3.2 ± 2.0 at weeks 24 and 52, respectively. Aflibercept patients in the GALILEO study  received a mean of 2.5 ± 1.7 injections during PRN dosing from week 24 to week 48, which is again in agreement with our findings. Overall, the results of this study show that real-world implementation of anti-VEGF therapy for the treatment of CRVO can lead to sustained improvements in VA and macular morphology, despite the fact that patients with ischemic CRVO were included in the analysis. The majority of patients (82.3%) had < 10 disc areas of nonperfusion, with 8.8% of patients presenting with macular ischemia. The findings from our study compare well with results from clinical trials, given the differences between real-life practice and clinical trials. The outcomes of real-life studies can provide important information for assessing the effectiveness of treatments in real-world clinics. Real-world evidence can complement data from clinical trials to better reveal whether treatments work in busy clinical settings. Our results approached those from clinical trials but did not achieve them. This is a common result for real-life studies and may be attributed to several reasons, with the most significant being the wider range of patients who are treated in real-world settings. Clinical trials are, by their very nature, carried out in a highly selective study population, which may optimize the results of the trial. Another important factor is the variable patient clinic attendance in clinical practice, whereas in clinical trials patients are seen and treated on exactly the right date to optimize clinical outcomes. The limitations of this study include its retrospective nature and the limited sample size. A further limitation is the use of habitual refractive correction based on VA measurements rather than on refracted VA. The use of refractive correction-based VA measurements can lead to less precise measurements, although it does reflect the method of VA measuring widely used in real-life clinical settings. There is no widely agreed protocol for treating macular edema secondary to CRVO with anti-VEGF injections. There is considerable variation between clinicians in terms of how many loading injections to use in real-life for the loading phase. The number of loading injections can be fixed or variable, continuing until the macula is dry or until maximum vision has been achieved. Clinical trials used PRN injections after the loading phase, which is not practical in the real-world clinical setting, particularly in publicly funded healthcare settings. Alternatives include fixed bimonthly injections or treat-and-extend. 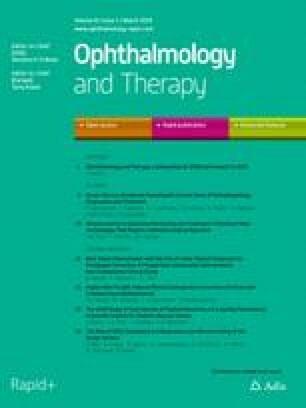 To the best of our knowledge, this is the first study to evaluate long-term VA and OCT-based retinal morphology outcomes of aflibercept treatment for CRVO in a real-world clinical setting that recommends treatment using a treat-and-extend regimen after the maximum VA gain and good anatomical response have been achieved. In reporting outcomes in real-life using a treat-and-extend protocol that approach those obtained in carefully selected clinical trial patients under precisely controlled clinical trial conditions, we demonstrate a treatment protocol which could actually be achieved in the real-life clinical setting. It is not practically possible in publicly funded healthcare settings to bring patients back for injections on a monthly basis for 6 consecutive months and then to follow these patients with monthly PRN injections. By contrast, a treat-and-extend protocol reduces the overall number of visits while benefiting patients and the clinical infrastructure by the certainty that each visit is for a planned injection. The close similarity between our results and those of various clinical trials strongly supports our approach of taking evidence from clinical trials and fashioning a practical protocol utilizing the trials’ findings to generate an essentially equivalent treatment pattern but without the assessment visits at which patients were not injected. The individualization of our protocol whereby patients continue on monthly injections until maximum vision is achieved means that quick responders are not overtreated and slow responders are not undertreated by a rigid protocol. All of this points to treat-and-extend as potentially a better protocol, although this proposal would need to be confirmed by a future clinical trial. Until and unless such trial data become available, we hope that our study will provide others with the evidence to use a treat-and-extend protocol for aflibercept in CRVO. In summary, the Moorfields protocol for treating macula edema in CRVO achieves a quick response to treatment without over- or under-treating patients with a fixed protocol. Our outcomes show that the individualized treat-and-extend protocol leads to robust functional and anatomical outcomes approaching those of clinical trials. The study and article processing charges were funded by the Moorfields Medical Retina Service. All named authors meet the International Committee of Medical Journal Editors (ICMJE) criteria for authorship for this article, take responsibility for the integrity of the work as a whole and have given their approval for this version to be published. Maria Eleftheriadou, Luke Nicholson, Giulia D’Alonzo and Peter K F Addison have nothing to disclose. This study was approved by Moorfields Research and Development Department (protocol number CA16/MR/35). The study conformed to the Declaration of Helsinki of 1964, as revised in 2013, concerning research in humans and animal rights. Springer’s policy concerning informed consent has been followed. This was a retrospective observational study based on previously conducted treatments and does not contain any studies with human participants or animals performed by any of the authors. The datasets during and or analyzed during the current study are available from the corresponding author on reasonable request. All data generated or analyzed during this study are included in this published article/as supplementary information files.